What’s up, gals!? Usually, I am greeting you all through your headphones on The Lightingale podcast, but we are taking a break and will be back with a brand new show in January 2019. Be sure to subscribe on iTunes or Podbean! Speaking of 2019, ya’ll, we are almost DONE with 2018. WOW! Can you believe that? I’m so excited about the new year and all that God is going to do! Are you? You should be, sis! I’m absolutely thrilled to introduced a new friend that I recently met online. 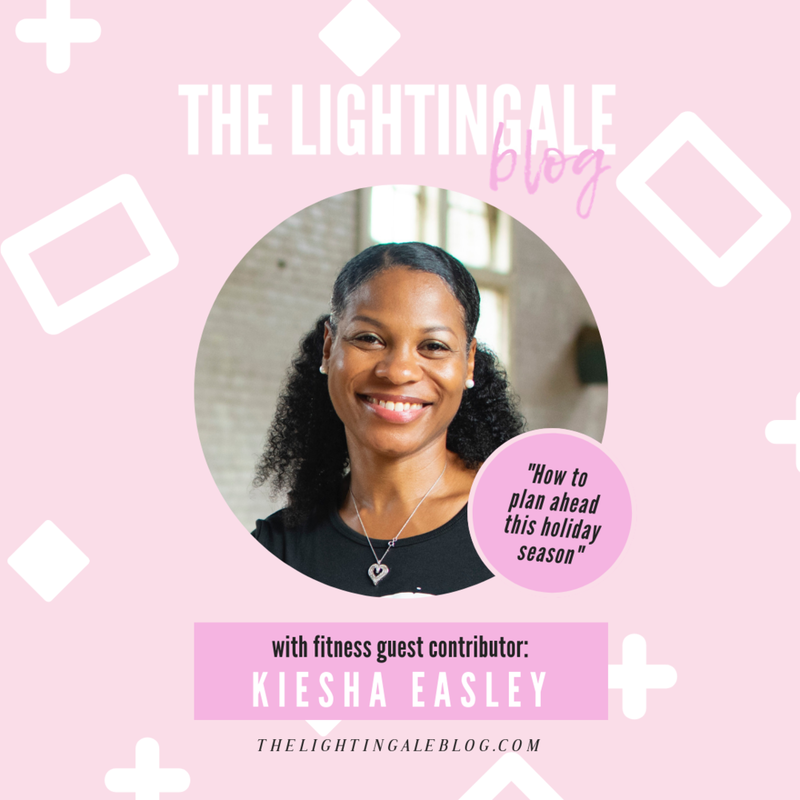 Wife, teacher and now author, Kiesha Easley started on a life changing fitness journey back in 2017. As she stayed on her path, she amazingly went down from a size 20 to a size 10 in about 7 months. LIKE, what?!? WOW! She lost 75 pounds and is KEEPING it off. She is the REAL DEAL. I can’t wait to share her plan of action to help us all maintain our fitness goals throughout the Thanksgiving, Christmas and New Year season. At the end of this post, you can find out more about how to connect with Kiesha and purchase her book, Worth The Weight. The holidays are coming up and for some of us, that means the end of our healthy eating habits and the reversal of all the good progress we’ve made throughout the year. Of course, this doesn’t just apply to the holiday season, but the whole year. If you fail to prepare and plan how you will handle temptation, you will fail to make consistent progress. Consistently adhering to a healthy lifestyle is challenging enough, but the holidays can really sabotage our efforts. It happens to the best of us. Several years ago, I made great strides in weight loss. My clothes were finally fitting a bit looser and I had been going strong for maybe 2 or 3 months when out of nowhere, Thanksgiving happened. The Wednesday before the holiday, I remember walking into the kitchen and being greeted by the most luscious looking cherry cheesecake. I had been caught so completely off guard by it that when my husband innocently came at me with a fork to taste, I automatically opened my mouth a took a healthy bite. Next thing I knew, I had eaten half the pie and that was the last thing I remembered about that attempt at weight loss! It was downhill from there and I was so far gone that I couldn’t even get myself together when the New Year came around. For years, I blamed that cheesecake for throwing me off course. But looking back, I came to realize, it wasn’t the cheesecake. It was the fact that I was unprepared. I didn’t have a plan for how I would handle temptation nor a plan for moderation. I just let the taste completely take me over and I immediately lost sight of my goals. I decided that I would never let that happen to me again. Last year, after starting my health journey, I decided I would let nothing derail me. I decided that I would enjoy the holiday food and festivities, but within predetermined limits. I decided ahead of time that during the Thanksgiving weekend, I would strictly adhere to eating a healthy breakfast and lunch. That way, I wouldn’t be ravenous when dinner time came around. Then for dinner, I decided which foods I would indulge in, and which I would pass up. I allowed myself to enjoy some dessert, but not the whole pie! When Monday rolled around, I immediately returned to my disciplined eating plan. When Christmas time came, I did the same thing. As the result of following a plan, even during the holidays, I was able to continue making progress and a year later, I have kept off those 75 pounds. Decide if you will completely avoid unhealthy food or if you will indulge. (If you’re just starting out, I recommend avoidance, instead. Rely on healthy substitutes and prepare healthy versions of your favorite foods). Decide on a timeframe: Will you indulge during dinner only? The whole day? Thanksgiving weekend, only? How will you handle the time between Christmas and the New Year? When will you return to your healthy habits? This will allow you to joyfully participate in the holiday festivities without feeling out of control or as if you’re missing out. It doesn’t matter what you decide as long as you adhere to whatever plan you make. If you say you will return to healthy eating on Monday, prepare in advance and make sure you do it. That’s the key to remaining consistent! That’s what will keep you from being completely derailed and will allow you to continue making progress or will help you maintain the weight you’ve already lost. So, no need to fear! Now that you’ve got a plan, you’ve got this! Kiesha R. Easley is a High School English Teacher, who found a solution that transformed her life. In 2017, she started a health journey and nearly a year later, she is 75 pounds lighter, looks 20 years younger and has more energy than ever before. She has regained her energy and health and wants to spread this message of healing. Kiesha is a native of Toledo, Ohio, who now lives in Columbia, SC where she and her husband raise hens, honeybees and a host of fruit trees in their backyard. Every year they plant a garden and grow many healthy leafy greens, herbs, sweet potatoes and other veggies using only natural methods – no chemicals, pesticides or herbicides. Kiesha was inspired to write Worth the Weight in response to all of the questions she received from people who watched her go from a size 20 to a size 10 in about 7 months. If she could lose the weight after years of trial and error, anyone could. The book shares the strategies she applied and offers a step by step approach to improved health, increased energy and sustained weight loss. Worth the Weight is available via her website and Amazon. Connect with Kiesha on her Facebook page and purchase her book, Worth the Weight on her website. Join The Lightingale blog mailing list by clicking here! Also, I want to hear from you! Share your thoughts in the comments below! The Lightingale exists to encourage and empower imperfect women in the perfect love of Christ. Hi there, I’m Danielle. I am a wife, mom, Christian blogger + podcast host. I encourage wives in Christ to pursue Biblical womanhood in their marriages and as they raise their children. You’ll find me trying to perfect my sweet tea at Starbucks, getting some work done during nap-time, and finding joy in making my husband laugh. BLOG post: OUr baby girl olivia is finally here!